SAL DeTRAGLIA'S VIRTUAL TAPAS BAR: STUPID-SIZE ME! Photo credit: The cardiologist in the next booth. My sister, Nina—concerned that I might be starved for American culture—sent me this photo of two men (undoubtedly tax partners from a large law firm) preparing to enjoy their Last Supper. They are at a bar called Denny’s Beer Barrel Pub in Clearfield, Pennsylvania. For $30, Denny’s will serve you THIS—a 15-pound hamburger. I’m not sure why anyone would want a 15-pound hamburger, but have long-suspected that if such a person did exist—he’d likely be living in Pennsylvania. This is, after all, a place where the first day of buck season is designated a state holiday. What? You think I’m kidding?! Certain people might cite this as a prime example of why the US has such a high rate of obesity; but I disagree. A 15-pound hamburger is not responsible for the Airbus®-sized girth of Americans. More likely, it’s the 15-quart mug of beer that comes with it. I mean...we have giant paellas here in Spain, but they're not intended to be eaten by one person. I think it would be funny if someone ordered one of these hamburgers, then sent it back because it wasn't medium-rare. Or the two gallons of ice cream that follow the beer. Meat and sugar. Cut it out of our diet, and we'd shrink to the size of the rest of the world. Sad? No.........this is more of a joke burger than anything else. It is not usually ordered by one person. There is a challenge for it to be eaten in a specific period of time, & if that's done it is free. I don't think anybody's been able to do it. There are also other smaller sizes of challenge burgers. 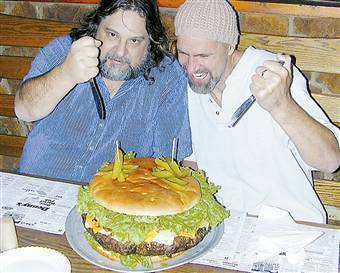 People have traveled from different parts of the country just for the challenge of trying this huge burger!! You have to call in advance so that it can be prepared. Come on people!! It is a JOKE CHALLENGE!! Not something we Pennsylvanians routinely eat on a daily basis! I live in Clearfield & have eaten at Denny's many times. They have good food, at normal portion sizes. Give the place a try!! Come visit Clearfield Pa & visit our many beautiful state parks; our section of the Susquehanna river to fish, canoe or just to enjoy the view; Bilgers rocks where you can climb over huge rock formations; in the summer see our huge Clearfield County Fair, antique at local yard sales, hike & swim in the state parks or, oh yeah, try a Denny's Huge BURGER CHALLENGE!! !